Belvedere, CA (September 11, 2018) - The 2018 Diversified Melges 24 U.S. National Championship, hosted by The San Francisco Yacht Club in Belvedere, CA concluded over the weekend with Kevin Welch's MIKEY team being crowned National Champion. A solid string of first place finishes further proves Welch's ability to dominate in the U.S. Melges 24 Class. With a full schedule of eight races completed, Canada's Richard Reid sailing ZINGARA was Welch's closest opponent and ended the event as runner-up, while the remaining top five positions went to three Corinthian teams. Representing the Santa Barbara Yacht Club, Kent Pierce at the helm of AVERAGE WHITE BOAT with team members Eric Stokke (co-owner), Jon Bell, Sarah Schaupeter and Lauren Bell finished the event in third overall, and took home the 2018 Diversified Corinthian U.S. National Championship title too. "San Francisco delivered!" proclaimed Pierce. "The Berkeley Circle is known for its big breeze and this weekend was no exception. Gratefully, it stayed manageable in the high teens and low twenties. From the first run of the first race, every downwind leg was full-plane. The steep chop created by the ebb, especially on port tack, was pretty rough, but at least it made the beats a bit shorter and the runs a little longer." "Just three weeks ago we sailed the Pre-Nationals on the exact same race course, same number of days, and the same number of races with virtually identical conditions. I think this allowed us to come out of the gate firing on all cylinders while some other boats were still getting acclimated," concluded Pierce. San Francisco's Doug Wilhelm on WILCO, and Duane Yoslov's LOOPER finished up fourth and fifth respectively. The U.S. Melges 24 Class is grateful for the support of title sponsor Diversifed, and always of the exceptional race management and event organization from The San Francisco Yacht Club. In particular, a very special thanks to Forrest Gay for his tireless efforts to make the Nationals the very best. The 2019 Melges 24 U.S. National Championship takes place on May 22-26, hosted by the beautiful Fairhope Yacht Club in Fairhope, Alabama. 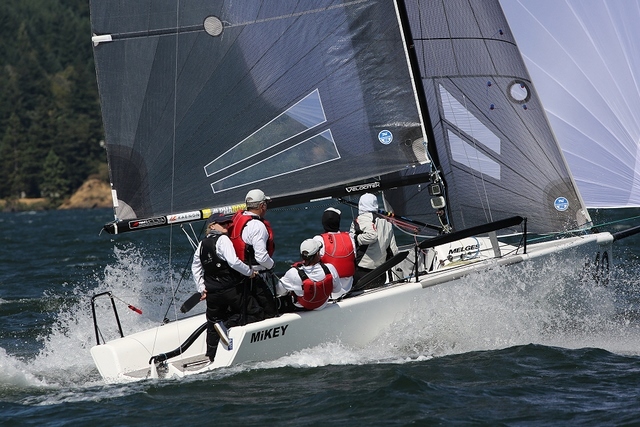 Typically, the Fall racing season for the Melges 24 is just as hot as it is all summer. The Fall Championship taking place on October 6-7 in Lake Geneva, WI is always a big hit. Register online to compete at this link. The Melges 24 is also thrilled to be a part of the newly formed Bacardi Winter Series starting with Event No. 1 on December 1-2, Event No. 2 on January 19-20, and the Invitational Regatta on March 7-9, 2019. Visit usmelges24.com for a complete listing of 2018 and 2019 events.